Jap chae is chewy sweet potato noodles stir fried on sesame oil served with a variety of vegetables. The name literally is the combination of the two words ‘jap,’ which means “mixed and stirred” and ‘chae‘ which means “vegetables.” Thus, a perfectly appropriate dish for vegetarian eaters. The unique texture and taste of cellophone noodles and the variety thinly shredded vegetables characterize the traditional dish. When do you eat japchae? Japchae is typically served at parties or celebrations. It’s an excellent dish to bring to a potluck, because a large number of people can easily share. But you do not necessarily have to be restricted to special occasions to serve japchae; you could make it for dinner and save the leftover for the next day. What do you eat japchae with? Japchae is usually served as a side dish. But it is also acceptable to have japchae as the main dish with rice on the side for a simple vegetarian meal. Maybe it can be an appetizer or a light snack. 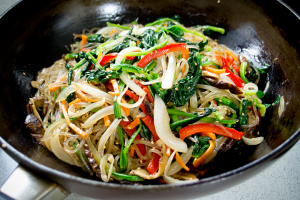 Are there any variations to japchae? Get your grain, your veggies, and your oil all in one yummy bowl by adding a bed of warm rice underneath! Stir frying the rice together for a creative upgraded version of japchae bap is another variation. Furthermore, the type of vegetables you put in japchae are completely up to you. The most popular ingredients include sliced onion, carrots, spinach, bell peppers, mushroom, and eggs. And lastly, japchae may be served either hot or cold.